The all-new Audi e-tron electric SUV is now available to order in the UK in two forms – e-tron and e-tron Launch Edition – priced at £71,490 OTR and £82,240 OTR respectively. 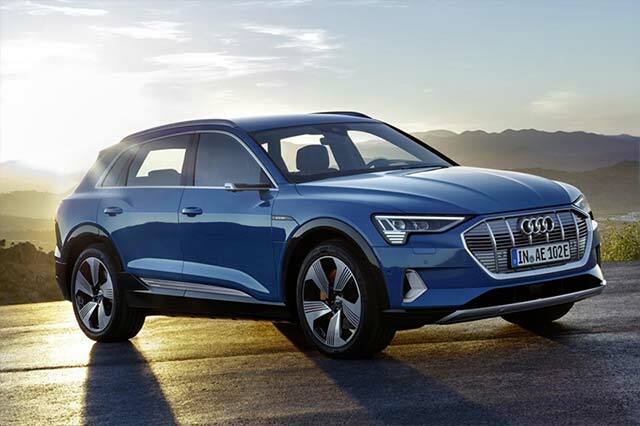 Like no other Audi before it in terms of technology, but with a familiarity to its look, feel and functionality that will ensure Audi drivers can become quickly attuned to it, the new five-seat SUV blazes a trail that will be followed by at least 11 more fully electric Audi models between now and 2025. A 95kWh battery mounted beneath the passenger compartment is the lifeblood of the new e-tron. It feeds two electric motors – one per axle – which jointly deliver an output of up to 300kW, facilitating 5.7-second 0-62mph acceleration, a top speed of 124mph and a driving range of up to 241 miles. Technology not surprisingly takes centre stage throughout the e-tron – the MMI touch response concept that first introduced intuitive touch-screen functionality into the latest A8 and is gradually progressing through the range is naturally the advanced operating system at the heart of this car. Visual hallmarks specific to the Launch Edition also include a black styling pack taking in the Singleframe grille surround and window cappings and privacy glass extending from the B-pillar rearwards. Inside, the e-tron’s Twin Leather upholstery is replaced by premium grade Valcona hide, and features such as a panoramic glass sunroof, electric steering wheel adjustment and a comfort remote preconditioning system further enhance life on board. The list of convenience features also expands in the Launch Edition to include adaptive cruise assist, camera-based traffic sign recognition and a 360-degree camera offering panoramic views of the exterior of the car, plus a bird’s eye view, to help with parking manoeuvres.